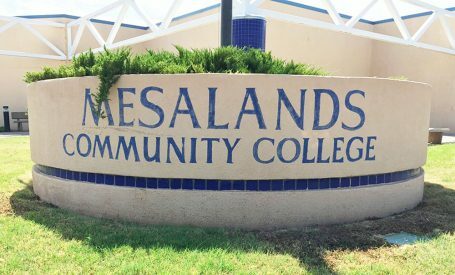 Mesalands Community College recently unveiled the Enrollment Plan: Recruitment, Enrollment Tracking, Persistence, and Completion for 2017. This document serves both the students and the community, fulfills the mission and purpose of the campus, and focuses on the four major components of enrollment management. The Enrollment Plan has been effective in stabilizing and improving recruitment, enrollment, persistence (retention), completion (graduation) rates, and student success at Mesalands. The first two components of student success in the Enrollment Plan are recruitment and enrollment tracking. This includes the College’s recruitment and marketing efforts to attract new and returning students to the institution. For the 2016-2017 academic year, Mesalands had a duplicated headcount of 2,158 students, compared to 1,933 in the year prior, for a 11.6 percent increase. These students were enrolled in 13,821 credit hours, compared to 13,063 credit hours for the 2015-2016 academic year, an increase of 5.8 percent. Mesalands also reported a four percent increase in the annual full-time equivalent. The next two components of student success are persistence and completion. The College has an obligation to retain students from semester-to-semester, and from year-to-year. As a result, this improves the student’s chance to obtain a college degree and/or a certificate. Completion success also includes job placement and successful transfer to four-year institutions. The annual persistence rate for full-time, degree-seeking students for 2015-2016 was 67 percent, which was consistent with the College’s five-year average. This is also more than 10 percent higher than the New Mexico Independent Community College (NMICC) average of 56.2 percent. For completion rates, Mesalands reported a 51 percent completion rate for fall 2015-2016, compared to 38 percent in fall 2014-2015, for a significant rise in completion. In addition, 79 percent of Mesalands graduates obtained employment or continued their education, according to the NMICC Accountability in Government Act Report. The Enrollment Plan defines the last component of student success, as helping students reach their individual goals and objectives. These goals may be to complete a course for personal enrichment, or to upgrade job-related skills or basic academic skills, to prepare for a bachelor’s program at a four-year institution, or to earn a certificate or a degree. Such diversity of student intent is challenging to track and is a unique difference between two-year and four-year institutions.